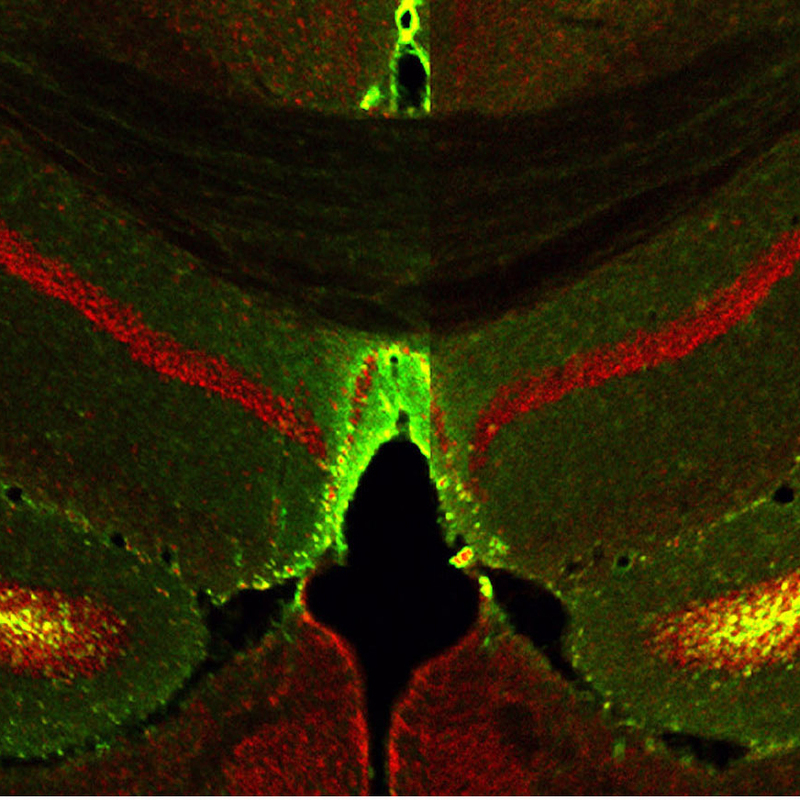 The hippocampus of a female mouse that has been genetically engineered to overproduce TIA1 protein. 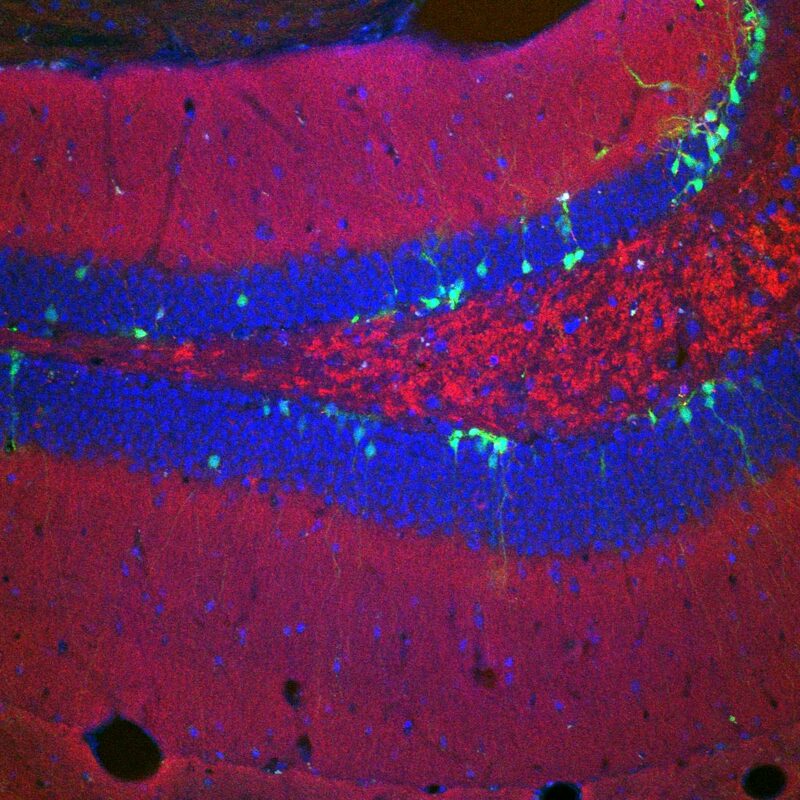 (The green color indicates neurons that produce excess TIA1, while the blue color lights up the nucleus of each cell to permit easier visualization of cells within the tissue). 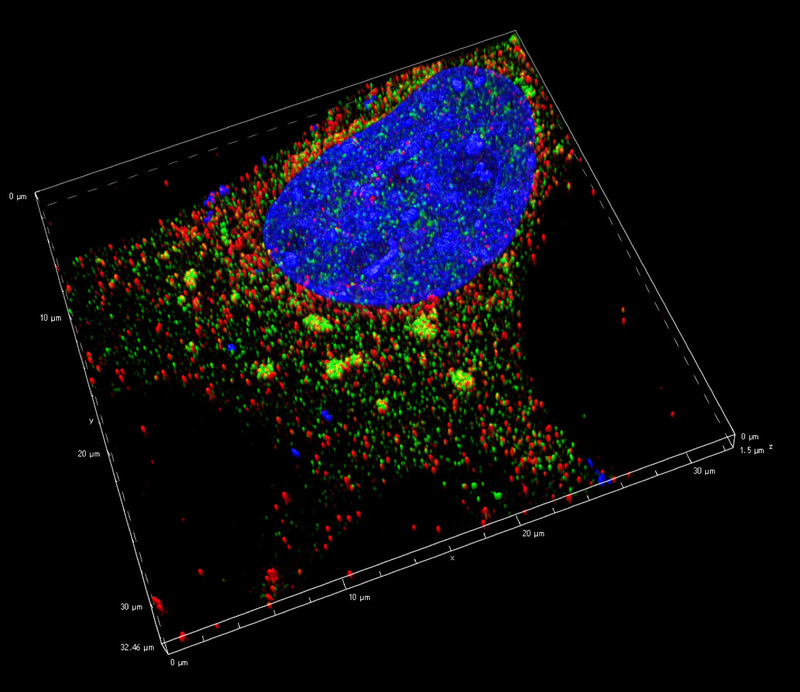 Increased levels of TIA1 protein lead to heightened activity of immune system cells such as microglia (shown in red). 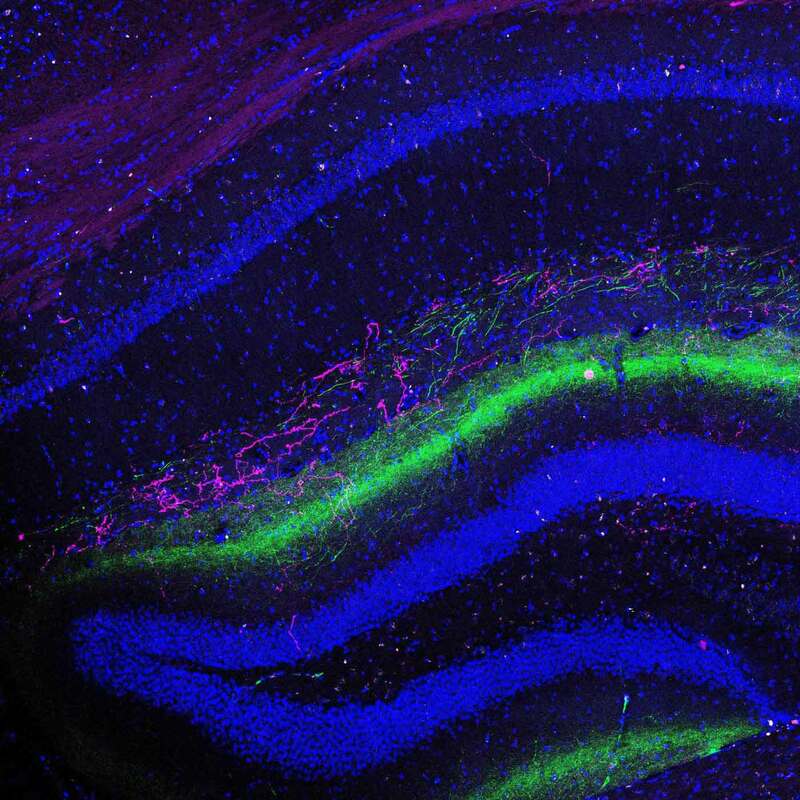 Immune system genes and cells not only regulate immune function, but also modulate brain function, including learning and memory (Credit: Joseph Rayman/Kandel lab/Columbia's Zuckerman Institute). More than 30 years ago, scientists discovered that neurological illnesses such as mad cow and Creutzfeldt-Jakob diseases are caused by misfolded proteins called prions. But in recent years, Nobel laureate Eric Kandel, MD, demonstrated in mice that some prions are beneficial and serve important biological functions in the brain and body. And today, new Columbia research from Dr. Kandel and his colleague Joseph Rayman, PhD, describes how one such prion-like protein, encoded by a gene called TIA1, helps the brain keep fearful memories in check. Without this gene, female mice exhibit the tell-tale signs of post-traumatic stress disorder, or PTSD. Advances in computational and theoretical modeling could soon allow us look at a person’s particular genetic composition and identify his or her risk for developing a psychiatric disorder, such as PTSD. But when the researchers removed TIA1, they saw a change in behavior — a change that was restricted to female mice. Removing TIA1 appeared to have no effect on the males, but the females’ avoidance behavior skyrocketed; their fearful memories were heightened significantly. This paper is titled “Genetic perturbation of TIA1 reveals a physiological role in fear memory.” Additional contributors include Joud Hijazi, Xiang Li, Nancy Kedersha and Paul Anderson. Genetic Perturbation of TIA1 Reveals a Physiological Role in Fear Memory.